It’s 5am, the sun is rising beside me as I’m writing from the rooftop of an Indian fishing boat after an epic 4 day trip through the Arabian ocean to finally see the Dragon Blood Trees of Socotra, Yemen. As I stand on the cusp of finishing my life long goal of truly traveling through every country in the world, I’m tired, filthy but content and wide awake. I’m excited to land in Oman and fly back to my adopted home of Thailand today or tomorrow. As I lay on my the blanket on the roof, sleeping is impossible, I’m excited. I’m proud of where I’ve found myself at 33, not literally on this boat, but where I am in life. I’m free and I’m happy. But 10 years ago last month (thanks for the reminder FaceBook!) I was flying one-way to Thailand with nothing but $25,000USD in student loans, a backpack, $1000 or so from my stint in medical research, and very little else. I didn’t know what to expect either from my year ahead teaching English in China or Thailand, or for the rest of my 20s. I guess I figured I’d have a fun year and then re-join the ratrace, get a ‘real-job’, join the masses, plan my holidays 6 month in advance, go to the same bars each week, support my football team, slowly put on weight and be none-the-wiser. Everyone else is doing it. I’d be no different. Things turned out differently, as they often do when we chase our passions, and 10 years it’s easy to look back and say it was easy. It hasn’t been easy of course, but I wish I could go back 10 years to reassure myself, and on that note, I want to give a little advice to any others in their twenties. Feeling unsure of themselves, unaware of what they want, feeling the social pressure to rush into a career, a mortgage, a relationship when they’re still young. You don’t have to. Here’s my advice to you in your twenties, just don’t show your parents. Walk a lot, soak it up, appreciate sunrises and sunsets, hug people, learn a language, be open and be honest, be proud but stay humble, stand up for yourself, learn the right time to walk away and the right time to throw a punch (there is one), explore other cultures and appreciate the ones so different from yours, eat street food, get food poisoning, take night buses, night trains, couchsurf, dont sweat the small stuff, seriously. Sleep in airports, get a tan, try to remember to work out, it’s more important than just vanity, I promise. Stretch often, try yoga, drink a lot of water, go vegan for a bit. Fall in love, have your heart broken, maybe break a few on the way too sadly, say goodbye, call your parents, tell them you love them and appreciate their sacrifices, make an effort with your friends, you’ll lose them otherwise. Be socially conscious, but don’t be self-righteous. Enjoy the ride for all it’s worth. Responsibilities will beckon one day, I promise you that, but not today, not yet. And when they say ‘youth is wasted on the young’, just smile back at them and say, ‘I’m sorry if yours was, but my youth wasn’t wasted at all’. That’s it guys and girls. My favourite saying, and my next tattoo, is “You’ll never be as young as you are tonight”, don’t forget it, life’s too short. I’ll see you on the road. Great article, Johnny! I like your travel experience. I’m passionate about traveling. Keep it up your passion. This is amazing! Oh how I wish I knew now what I did at a younger age!! Your advice is spot on & I hope people of all ages apply it to themselves. I knew at a very young age I wanted to be a flight attendant. However; it took me two other careers and each of my parents dying ~ for me to finally have the courage to go after my dream. Now in my 19th year as a flight attendant at Delta; my excitement and wanderlust is just as strong as it ever has been. 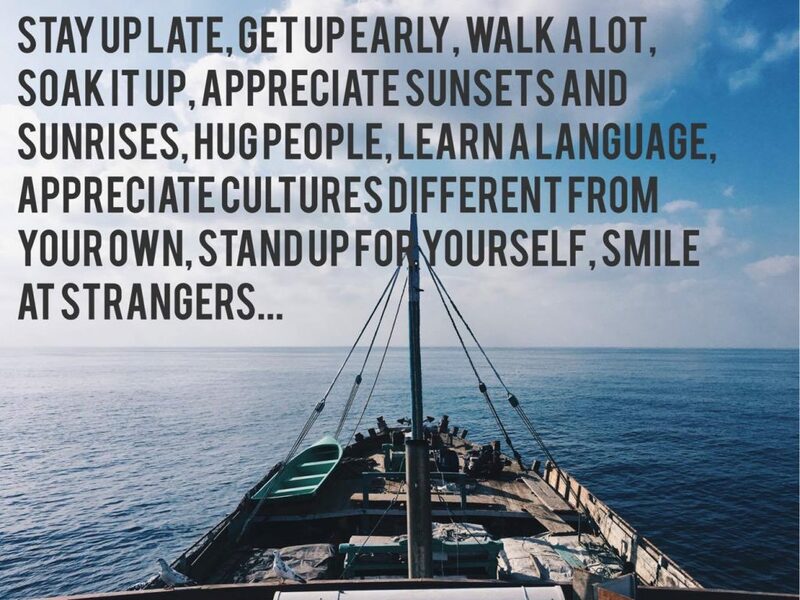 I long to travel to places I have never been, To learn the local cultures and make friends out of strangers. Thank you for sharing your journey online & inspiring me to pursue more of the places I want to visit. Actually I think I want to do a trip around the world next year (to commemorate 20 years of flying) and would love any insights you could share with me. Keep posting these Motivational Mondays! Very well written. And you are true inspirational. Dude, your advice is not confined just to young people. Ha! I’m 62 and still don’t know what I want to do, except travel, which I do. I’ve found that mobility, as in keeping physically fit enough in a reasonable manner, helps tremendously. Here’s some old man wisdom – You either love traveling, or you don’t. Thank you very much, Johnny, for your awesome inspiration. Hi Johnny. I stumbled upon your blog while looking for some info on teaching English Lit in Thailand. Could you inform me on the prose, poems etc used in the teaching of literature ? I am in Malaysia right now, and we are expecting some English teachers from Thailand in our uni next month. I need to prepare a workshop for the teachers. Thanks so much ! U r my inspiration..need to talk 2 u.. Thanks to give me too, motivational thought and i like this one. Mike Corcoran: keep going! Now hitting 68, still do crazy things like this. Love it. You’re right, you’ll never be as young as you are today. Life’s not a rehearsal. Been following your story for a few years now, glad to see you’ve almost completed every country! I’m going to graduate college this year, and the pressure to rush into a career is VERY real. Thanks for your advice! LOVE IT, Johnny! Love the way how you express your feelings. You are doing an amazing job. I feel lucky enough to be aware of all of the above you mentioned. I also started a blog to share my experiences, tips and thoughs. Doing my best to live to the fullest against all odds. Keep up the passion! Great to hear Meltem, and thank u! I just found your blog yesterday and have been reading all your archives! What a great post to start with. As a young twenty-something I will be taking your advice and doing all those things, because no one ever regretted an adventure they had or a chance they took. You’ve lived a fantastic decade, I hope mine coming up is just as fulfilling! Looking forward to following your blog from here on out. Thanks for very inspiring post Johnny! We just have one life and it’s up to us on how we will use it.. So awesome! To live fearlessly is a gift unmeasurable in gold. Keep living and Inspiring Johnny. You reach the hearts of many. That’s really life in a nutshell! something we all need to keep doing, thanks buddy! Amazing post, Johnny! You keep inspiring more and more! Keep it up! Love the last line – You’ll never be as young as you are tonight. I’ll see you on the road.